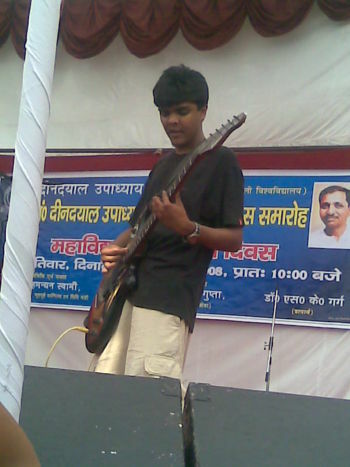 ammmm ... Its very difficult to tell about myself .. Me .. amm Samarth ?? well to start of I am real die hard fan of music!!! luuuuuuuuvvvvv rock can listen to pop ... but hate rap and hip hop . I love soccer .. support manchester united like mad , have been supporting manchester united like hell .. ( yeah !!!! glory glory manutd!!!! ... as the reds go marching on on on !!!) and am really addicted to friends .. ( joey being my favourite charachter ) and about my sense of humor ... its better that I dont say anything ..
cuisines and me! !I love to eat.. not that big a fan of chinese ....... luuuuvvvvv italian food ( have kinda Joey monster growing inside me) ammm .. a big cannibal ..... luv to eat chicken ...... What the hell... I can eat anything and everything!!!!! This page was last modified on 19 February 2009, at 15:38.